I started off this wash day feeling super excited because I finally got parking so I could pop into my favorite beauty supply store. This trip was extremely important because I was in need of new flexi rods; my current ones are now too small and are a little worn. Anyway, with new flexi rods in hand I decided that I would do two-strand twist and then install my flexi rods for a funky look; it didn’t work nor did the braid out the following day. Prepoo/co-wash- I decided to forgo a proper prepoo and instead gently finger detangled before spritzing each section with water and applied As I Am coconut cowash. Once my entire head was detangled and cover with my co-wash I jumped in the shower to wash my hair. I did a gentle scalp massage to ensure that my scalp was properly cleaned. Protein treatment- I am currently 47 weeks post relaxer and I haven’t done a protein treatment in a while, therefore I grab my Aphogee Keratin 2 minute reconstructor and applied it to the ends of my hair then my new growth. I then rinsed out the treatment with warm water; after the treatment my hair felt good. Deep conditioner- Out of pure laziness I wasn’t going to do a deep conditioner but I changed my mind at the last minute when I saw my bottle of Jamaican black castor oil (who can resist!). 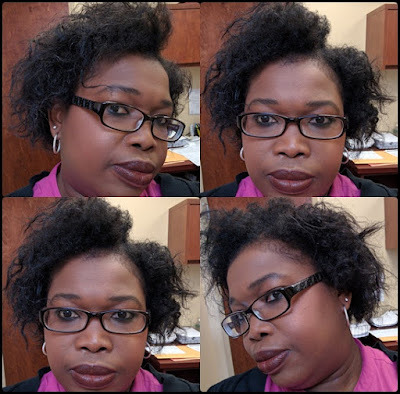 To deep condition I added about two tablespoons to my Shea Moisture 10 in 1 renewal systems conditioner and applied to my hair. I then sat underneath my hair dryer for 10 minutes; after allowing my hair to cool I rinsed with warm water and followed up with cool water. I must say, my hair was feeling super moisturized which I love. Leave-in conditioner- After rinsing out the conditioner mix, I wrapped my head in a t-shirt to get rid of the excess water. I then applied Shea Moisture Jamaican black castor oil strengthen, grow and restore leave in conditioner and detangled and left the hair to air dry. Moisturizer- Two hours later I applied African Pride Shea miracle buttery cream moisturizer and detangled again. After which I sectioned my hair into smaller sections and applied Shea Moisture coconut and Hibiscus curl enhancing smoothie and did a two strand twist the wrapped each twist on to a purple flexi rod. In total I installed 13 flexis and off to bed a when. After taking of the flexi rods I could hear the music from the movie Psycho playing. The horror my hair was not dry and I have to leave my house in 20 minutes; yes I always do my hair last just before I pick up my bags and head to the door. Once I took out the twist it was worse than I thought, so I took out my hair pins and pinned it up. That evening I spritzed my hair with Ettenio refresher sprayed and sectioned my hair into small sections and braid then. I had great hopes that I would have a nice defined hair in the morning but alas that wasn’t to be, my ends was straight and my roots look puff but I wore it any way and felt fabulous. I am still trying new things and figuring out how to get my hair to behave but I am coping when it misbehaves and feeling confident that I am fabulous no matter what. How was your #washdayexperience? 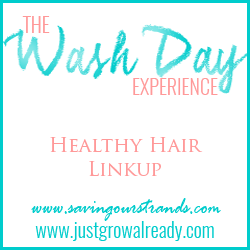 Please join the ladies of the #washdayexperience for tips, tricks and fabulousness. "confident that I am fabulous no matter what"
The absolute best thing that I've read all day! You betta WERK IT girl! I've totally been there before with that wet morning after hair especially if I've set my hair in small sections. My favorite way to get my hair back together is to set the hair on steam rollers then use my dryer to dry my hair. The steam rollers give the hair a cute curl and it helps my hair dry---fast. Thank you darling. I have definitely learned my lesson, my natural hair is much denser than my relaxed hair so overnight hair has to be dry. It sure was, I am so pumped to be at this point, in a few more weeks I'm at the one year mark. I can finally see the two textures. It takes time when it comes to natural hair. It does, and it can be quite frustrating but so worth it.